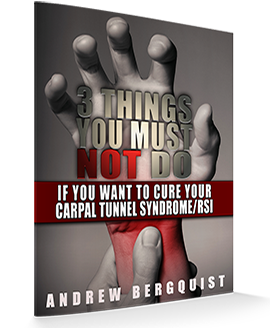 Revealed: Former Sufferer Explains How To Cure Your Pain With This Simple, Natural Solution That Addresses The Root Cause Of Carpal Tunnel Syndrome/RSI! Want To Partake In Your Favorite Activities Pain-Free? Or Even Just Be Able To Sit Still Without Tingling, Soreness And Pain? If you’re tired of living, or merely surviving your day-to-day life while in immense pain, then you have come to the right place. If you are experiencing pain, soreness, numbness, sharp "pins and needles" pricks, strange sensations and tingling, or weakness and loss of strength, then this may be the most important letter you will read in your entire life. If you’re wondering why you should listen to me, then you should know that I too was once in your shoes, searching the internet for something that would put an end to the seemingly endless pain in my hands, wrists, and arms. Therefore I understand what you're going through. I understand the never-ending pain and discomfort that you struggle with every day, which sometimes seems to be taking over control of your life. I understand the anxiety you feel as you search for a cure, hoping to stop it before it gets worse. I understand the fear that you feel as you wonder whether the pain will ever go away, or whether you’ll have to suffer for the rest of your life. I, too, felt frustrated and helpless after I spent months trying various treatments, programs, and exercises that gave me no results. You've likely been on a similar path, searching for a cure in a world of misinformation and false promises. If so, it's not your fault, and I don’t blame you if you’re thinking that this is another one of those programs. This information is centered on a simple solution that cured my pain and, if you give it a fair chance, will also cure yours. The more I learned about carpal tunnel syndrome, the more my symptoms intensified. As it turns out, this was not simply a coincidence. But I had been hit by a car, while I was parked, no less, two months before the onset of these symptoms. This caused an unwanted adjustment of my neck and shoulders, including pain and soreness, which several visits to the chiropractor could not fix. Perhaps this was the cause of my carpal tunnel issues, possibly a pinched nerve, I thought. It turns out that all of my plausible explanations, including working long hours with poor posture, were completely wrong. My months-long search for relief led me to all kinds of information, including recommendations for splints, surgery, physical therapy, abstention from wrist movement (! ), and medications to mask the symptoms. However, I wasn’t willing to settle for a treatment, I was looking for a cure. Surgery that would “fix” carpal tunnel syndrome for many people was often only a temporary solution, as it doesn't address the source of the problem, only the symptions (which often reappear anyways). It would also fail to address my shoulder and neck pain, not to mention the ugly scars it leaves on the bottom of the wrists. So I ruled out surgery and kept looking for a real solution that would address the root cause of the pain. I ended up trying various programs and exercise routines, including one that I followed devotedly for months without any results. Highly discouraged, I abandoned the program and continued my search for a real cure. What I eventually found amazed me, and I immediately knew that I needed to get the word out to other sufferers so that they too could return to a pain-free life. If you give it a fair chance, what you find in this report may change your life, and possibly those of your loved ones, forever. Whatever you do, if you want to recover completely, you must avoid programs that focus on physical exercise routines, medicines, or treatments such as cortisone injections. Of course carpal tunnel release surgery would be the worst possible option. 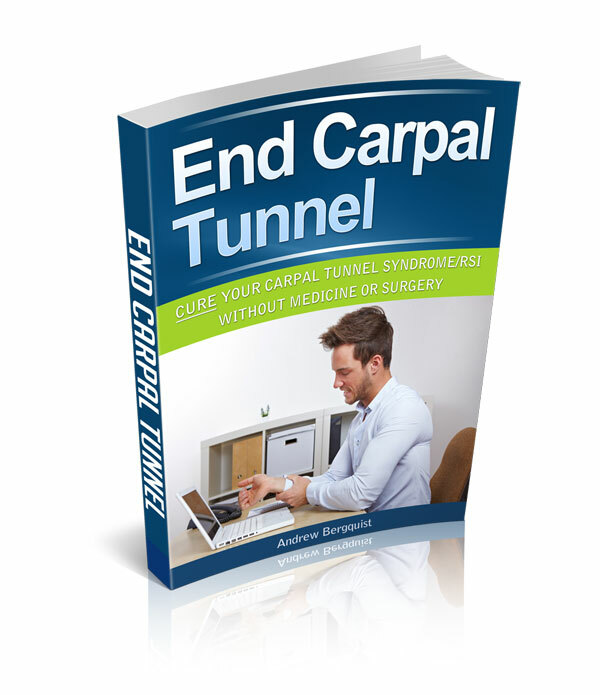 The solution featured in End Carpal Tunnel is the only solution that focuses on the root cause of the problem, and therefore the only solution that offers a true cure. Unlike programs that employ stretches and wrist braces, this does not rely on the problematic placebo effect, which addresses the symptoms and leaves the underlying issue untreated. But let me be clear, this program is not a magic pill that will instantly cause your pain to disappear. If that is what you are looking for then all I have to say is I wish you the best of luck. DISCLAIMER: While some people do experience significant relief within 24 hours, it is not something that everyone should expect. One thing to keep in mind is that everyone is different, and therefore everyone has different recovery times. For some of you this program will take very minimal effort and for others it will be a bigger commitment. That said, those of you who are willing to commit to this simple program will experience significant relief, guaranteed. Now if you're ready to drastically improve your life, then I would like to extend you my warmest welcome! ...To wake up in the morning excited to face the day instead of lying there suffering in pain? ...To no longer have to decline to participate in sports with your children or friends because of your pain? ...To look forward to events that previously you would've feared in anticipation of the pain that would result? ...To end the uncertainty and doubt that you'll ever recover, having to live out the rest of your life this way? ...To be rid of the envy you have for everyone that lives without pain, and feel immense gratitude instead? ...To put an end to the seemingly infinite number of medical bills that you've been paying? ...To have your life back? Now you're probably wondering, what would a report like this cost? Personally, I would have paid hundreds of dollars for it. Easily. And I'm normally extremely frugal. In fact I spent more than that on chiropractic treaments and online programs that weren't targeting the root cause in the first place. Undoubtedly I would've spent even more in medical bills, which would have led me further down the wrong path, putting me even further from recovery. That's not to mention potential surgery bills that could add up to well over $10,000 for a procedure that doesn't even address the underlying issue! But I'm not going to charge you that much. Not even close. Even though this is the only solution for curing Carpal Tunnel Syndrome/RSI, I want to make sure that it's affordable for everyone. You've suffered enough already. For a limited time (and yes, I really mean it), I am offering you an opportunity for a new life without chronic pain at an incredibly-low price. Unfortunately I wouldn't be able to keep the price this low forever without being overwhelmed and having to lower my standards of customer service and support. That's right, for only $27 you can start to take back your life TODAY! Warning: Reading this report will change your life! Have questions? I've got answers. Q: How is your program any different from the others? I bought a program but it doesn’t seem to be helping at all. In fact, it seems like my pain is getting worse! A: End Carpal Tunnel is completely different in that it addresses the root cause of problem, not simply the symptom (the pain). This solution is not a band-aid but a cure, and does not rely upon the placebo effect to work. Q: Is it too late for me to use your product? I’ve had chronic hand and wrist pain for years. A: No, it is never too late. My product will help you whether you’ve been suffering for days or for decades. Q: Why should I listen to you? A: Because I have gone through the same thing that you are going through, and now live a life free of chronic pain all thanks to this method that I'd like to share with you. A: The solution can work for anyone as long as you give it a fair chance. 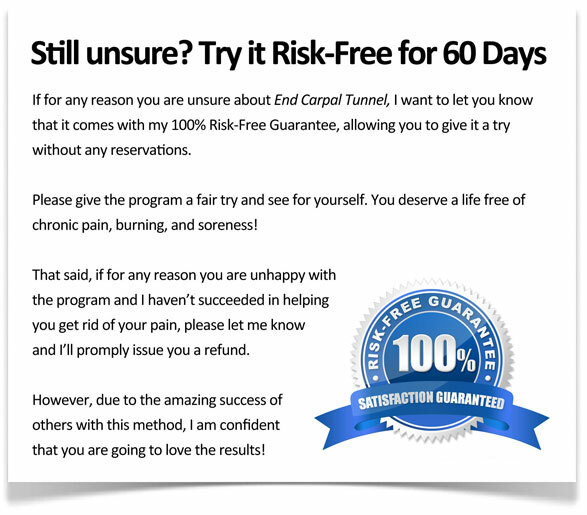 That said, if for some reason you are unhappy with the product, feel free to take advantage of my risk-free 60 day guarantee. Q: Is the product an exercise routine that I have to continue indefinitely? A: No, this is not a set of hand/wrist exercises that must be repeated continually, it is a cure, and is not based on physical exercises or routines. Q: How long before I will begin to see results? A: For some, under 24 hours! Everyone is different, but many experience significant, if not complete relief within two weeks. Q: Can I completely get rid of my pain with your program? Here's to your new life! P.S. Please don’t let your doubt cause you to continue suffering. Cure your pain now with this simple, all-natural solution! Please stop going to bed in pain wondering if it will ever end! You have the option to end it NOW! P.P.S. Don’t make the mistake of thinking that this is just another generic treatment program that doesn't address the root cause of your pain. I can help you cure your pain even if all other treatments have failed! You have nothing to lose except your pain! Click below to put an end to your pain! Is the anything you would like to ask? Click here to contact me. Still Undecided? Don't Walk Away Empty-Handed!